As someone on a constant quest to find the best Sunday lunch in the North East (aside from my own offerings, of course), I have consumed my fair share of roast dinners. Our region is brimming with restaurants, pubs and bistros, all offering their interpretation of the traditional Sunday dinner. To me, the roast is a weekly rite of passage, the Last Supper of the weekend if you will, so I’m pretty passionate about finding The One. 1) The Meat: Sorry veggies, but the meat on a Sunday roast is always the pièce de résistance for me and The Broad Chare don’t mess about when it comes to their roast beef. 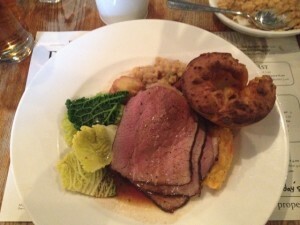 Moist, perfectly pink and gloriously succulent, this is the roast beef to conquer all others as far as I’m concerned. 2) The Roasties: I’m all about having a little bit of what you fancy, so I don’t feel bad in indulging in a few calorific drops from potato heaven. Good roast potatoes are an art form; crisp and golden on the outside, basted in the stock from the roasting joint or some goose/duck fat, then boiling hot and fluffy on the inside. Top marks again to The Broad Chare, I found three quite large roasties blanketed by the roast beef and I could have eaten them all day long. 3) The Yorkshire Pudding: Whoever said size doesn’t matter was lying. I have no time for teeny little Yorkshire puddings, or worse still, frozen ones. 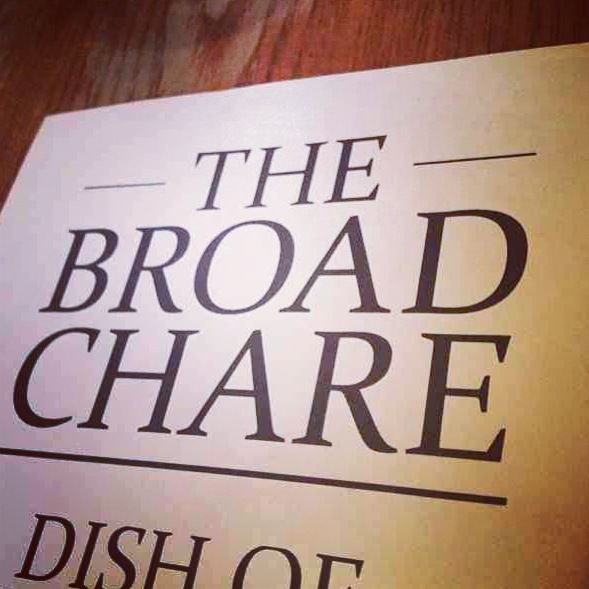 Thankfully, there’s nothing to worry about in that department at The Broad Chare. They are huge, crispy on the outside, hollow on the inside (there’s nothing worse than a Yorkshire with made with too much batter mixture!) and everything I wanted and more. 4) The Gravy: Now, I consider myself to be a real gravy connoisseur. I don’t have anything to back this statement up of course, but there’s times I’ve found myself with a spoon in the gravy boat so I can demolish any leftovers, so I know a good gravy when I taste one. The Broad Chare’s is more of a jus, actually, but what it lacks in consistency it makes up for in flavour. Reduced stock from the roasted joint of beef is well seasoned and plentiful, although if I’m honest I still had to ask for an extra little pot to fill my Yorkshire up. Normal people (i.e. those who are not gravy addicts) will not have to do this. Accompanying these four delights is a variety of veg, ranging from savoy cabbage to parsnips, green beans and roasted beetroot (selections vary each week), delivered in large sharing bowls to your table. Drinks come in the form of a host of traditional guest ales, beers and ciders, with handy recommendations of what works well with food and high-quality wines (check out their From The Cellar list, written on the wall – some pricey but amazing offerings to sample!) as well as high-quality soft drinks from Fentimans. All visitors to The Broad Chare need to sample the bar snacks on offer. They are amazing. We opted for a selection of Crispy Pig’s Ears, Deep-fried Monkfish Cheeks, Cauliflower Fritters with curry mayonnaise (my personal favourite), Middlewhite Pork Crackling and Lamb Scrumpets, instead of having individual starters. In hindsight, this was way too much food for the two of us, but they are all so delicious that they didn’t last long regardless. All bar snacks are priced reasonably, ranging from £1.80 to £3.50. Due to the over-eating, we couldn’t squeeze in a dessert, but having tried a few on past occasions I can officially certify that they too are top notch and very modestly priced. The décor is quite simple, and comprises of solid oak tables and chairs with images of Olde Tyneside framed on the walls, thankfully, it’s lost none of its historic charm. All menus and wine lists are written around the dining area on huge mirrors, which is quite handy. Our waiter, Craig, was knowledgeable, efficient and just dead canny really. We’ve visited a few times both for Sunday roast and normal dinner midweek and he is always in control and cheerful, despite how busy the place tends to be. One thing I must add is that you simply have to book. 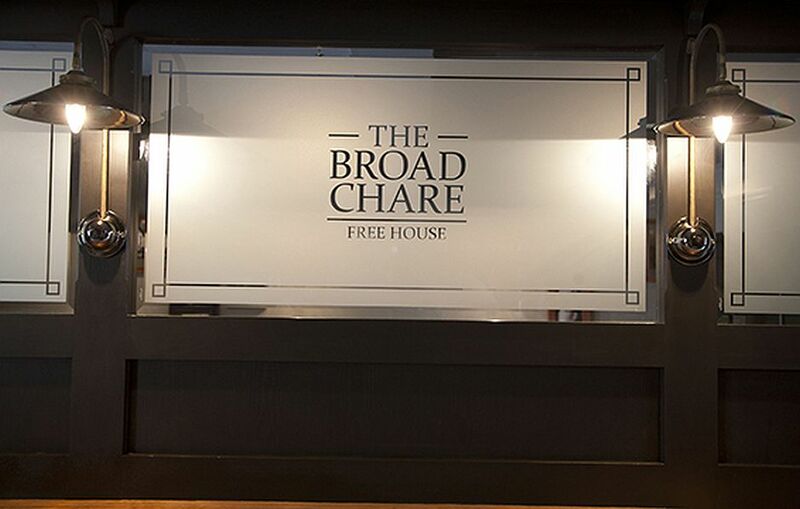 When The Broad Chare opened it was possible to walk in for a table on a Sunday, but those days are gone. Good news travels fast, so if you want to eat there you need to book in advance. They can accommodate tables for two or large groups and every person in that dining room receive outstanding service, in my opinion. So… have I found The One? Well, it’s a bold statement but I think I might have! There’s something about The Broad Chare that always keeps me coming back for more and it’s always my first choice for Sunday lunch out. I love the atmosphere, the fact they are constantly offering something different (their game pies are on another level), the location, the history seeping from the walls… just everything really. If you haven’t been yet, make this Sunday your first visit. I promise you won’t regret it. To book, call (0191) 211 2144 or head over the their website. The Bank Low Fell – Back in Business! Previous Post Cal’s Own: The Best Pizza in the North East. Next Post A Damn Delightful Birthday Dinner: Café 21.